Obviously, we carry the Stars and Stripes. And, of course, we carry the Marine Corps Flag. 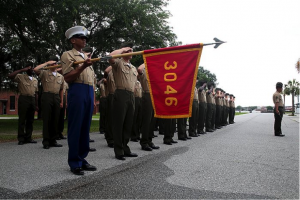 There’s one flag that likely stands out in the minds of every Marine who has come through one of the Marine Corps Recruit Depots: The guidon flag. According to the official USMC Flag Manual, “the guidon flag is a unit flag carried by companies, batteries, and comparable units as a unit marker and for other purposes.” The guidon flag is the official symbol of the fighting unit it represents. The specs go on and on; outlining the height of the numbers and letters, when to use “USMC” and when to use “FMF” above the emblem, et cetera, et cetera. For Marine recruits, the platoon guidon plays a similar role to a company guidon. There are two major differences, however. 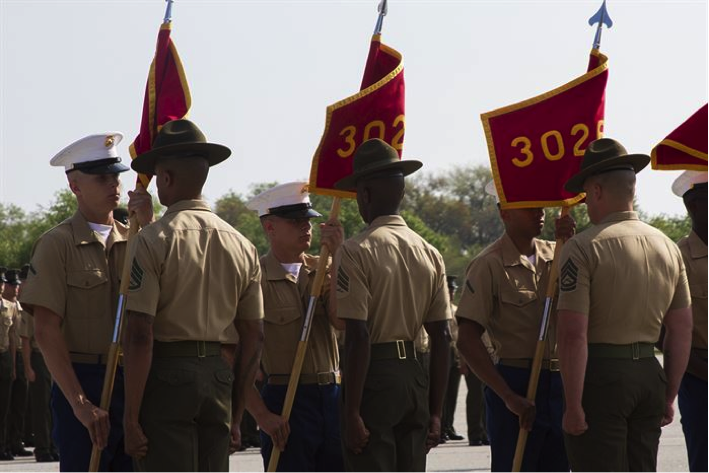 One difference is that a recruit guidon represents a platoon, which is smaller than a company. 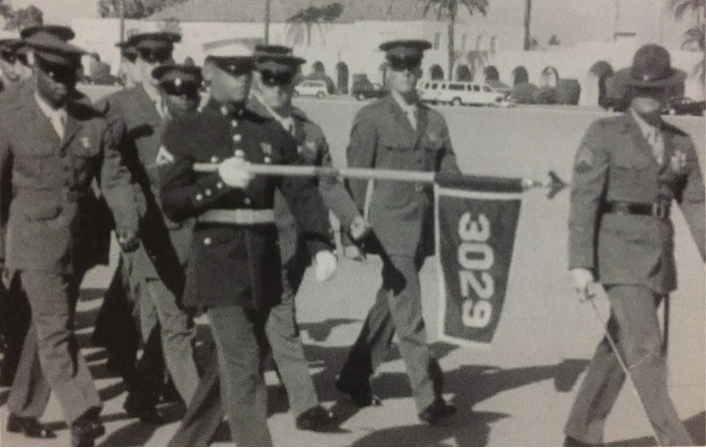 The “…and for other purposes” description from the Flag Manual referred to the fact that recruit platoons carry guidons. The design of the recruit guidon is the other difference. It’s still scarlet and gold, still carried on a guidon stick, and still carried by the most squared-away person in the platoon. But it doesn’t have all the bells and whistles like the Eagle, Globe, and Anchor; it just has the platoon number sewn onto it. The platoon number carried on the guidon flag becomes etched into the minds of that platoon’s members. And it’s especially mesmerizing to see drill instructors take the guidons back on graduation day; symbolizing the end of recruit training for those new Marines. Ask any Marine, whether they graduated from boot camp earlier this year or earned their title and shipped out to the jungles of Vietnam. They’ll most likely be able to tell you their recruit platoon number and name off all their drill instructors. I know I can. My platoon number was 3029. Our guide’s name was Travis. I was squad leader for 2nd Squad. Our DI’s were all sergeants (a rank I would later achieve): Boydstun, Bender, and Martinez. I’ll never forget these details, because the experiences they remind me of shaped me into the Marine and man I am today. And it all comes back to a number on a flag. 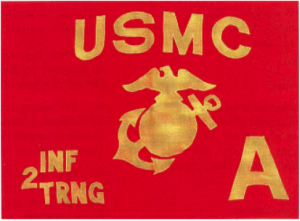 Have questions about any of our Marine Corps Guidon Flags? Give us a call at 1-888-697-3524 or contact us online! I graduated from Marine Corp bootcamp in April 1977. How can I get my Platoon guideon? How much will it cost me? My platoon was 3012. Hi Louis – we would be happy to help you. Here is a link to two different types of custom platoon flags that you can order directly on-line. You can also call us at 1-888-697-3524 and one of our sales representatives can help you.